I stand in awe of the sheer cheek of Yves Camdeborde's L'Avant Comptoir wine bars. 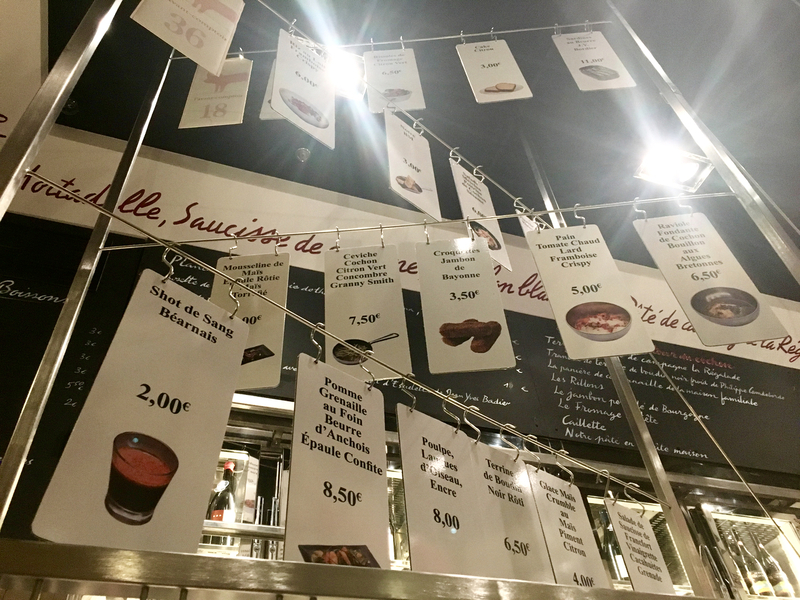 Camdeborde had the insight to reproduce San Sebastian pintxos bars in Paris, a city where dining standing up is considered an abnormal act, like sleeping suspended from a ceiling. The success of L'Avant Comptoir and later L'Avant Comptoir de la Mer has validated Camdeborde's approach. No one has replicated it; very few have tried. The L'Avant Comptoir concept has become like the ancient megafauna of island nations, which, lacking any serious competition or natural predators, grew to outlandish proportions. 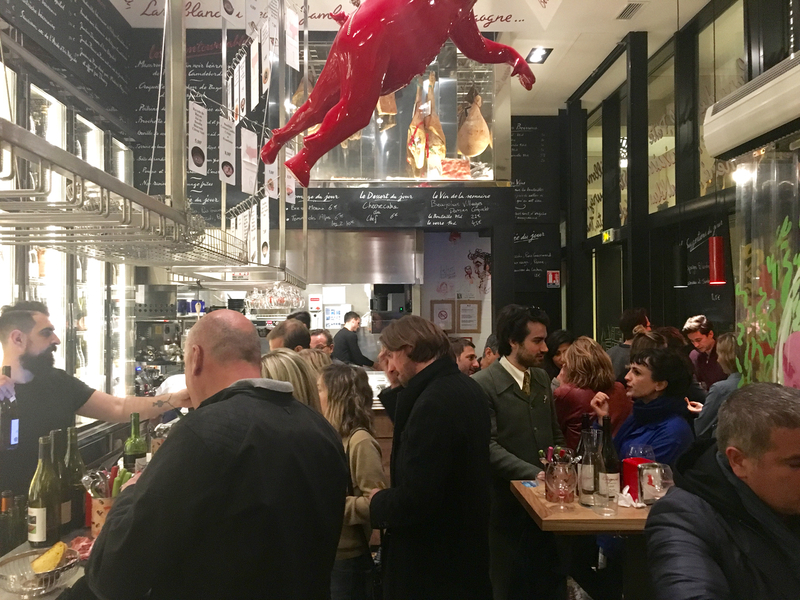 L'Avant Comptoir du Marché, a relative juggernaut compared to the other two, opened in early fall of 2016 in the marché du Saint-Germain. The bar's entrance consists of car-wash-like mud-flaps bearing images of grinning pigs. 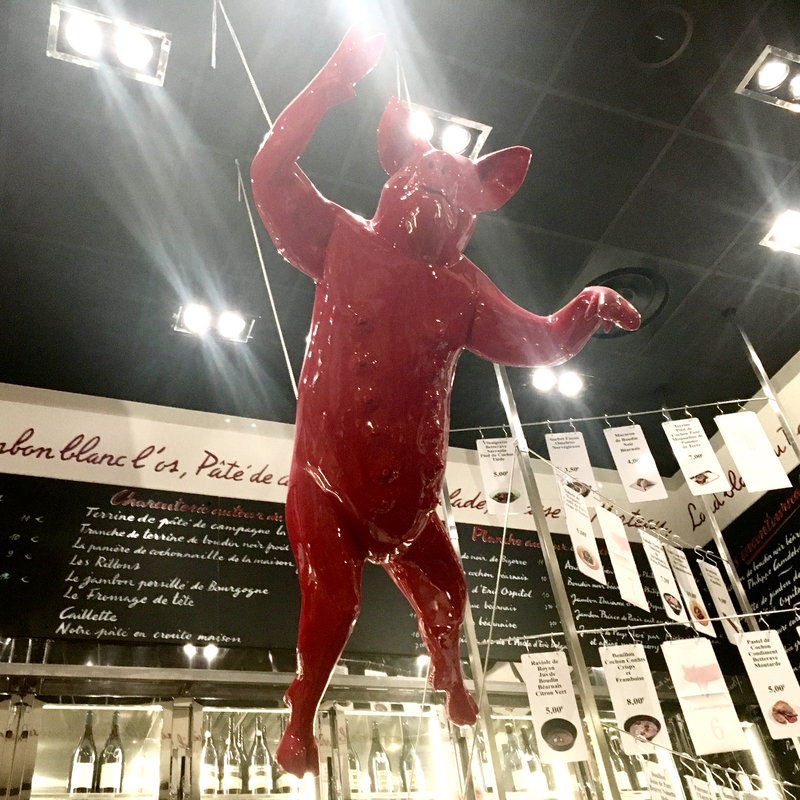 A lurid red pig sculpture hangs like a martyr above the dining floor. It looks like something purchased from a Russian home décor emporium. One glance at such garish design indulgence normally sends me scampering like a refugee back to the skeletal bistros of the 11ème. If I nevertheless enjoy the occasional visit to L'Avant Comptoir du Marché, it's because there's a heroic irony how Camdeborde employs all the shlock arsenal of industrialised mass restaurateurism in the service of selling artisanal products: excellent pork and natural wine. That light seasoning of commercial insurrection unites the restaurant group's otherwise wildly inconsistent menu offerings. The 2€ 'blood shot' (a blend of cooked pork blood and bearnaise) is meaty and warming, a liquid boudin noir, nowhere near as daring as it sounds. Tripe with arugula, fish roe, pickled red onion, and a cream emulsion was silken and delicate, belying its throwaway plating. 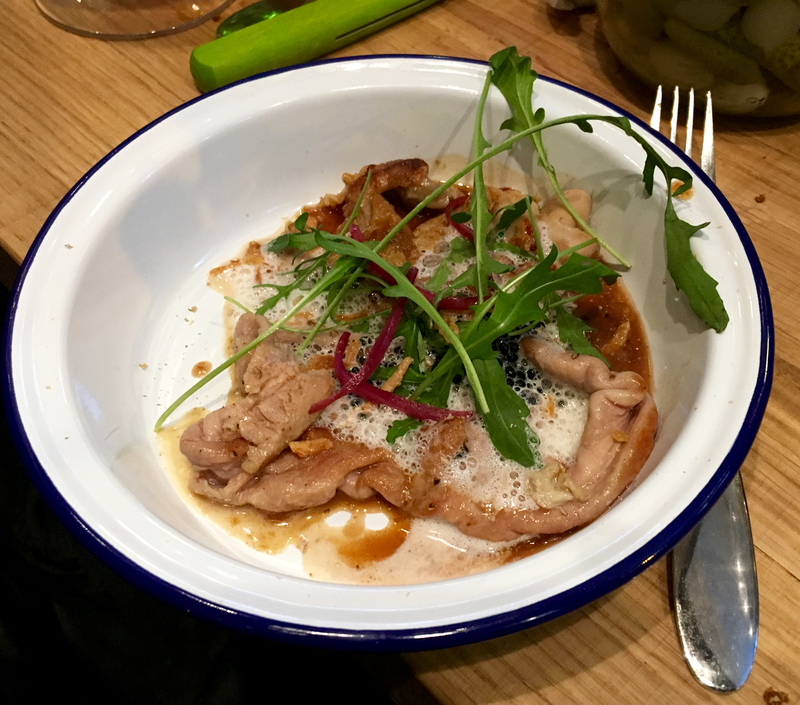 But in the kitchen's commitment to devising strange new presentations for pork, the ratio of hits to misses is pitiable. On a recent visit, a friend and I shook our heads in bug-eyed horror at a warm vinaigrette of pigs' feet and beets, the rare dish that looks and tastes the same at first bite as it would after being rejected by the stomach. It was gruesome even on an ergonomic plane: the beet liquid gorily leaked into the rest at the slightest touch of a fork. 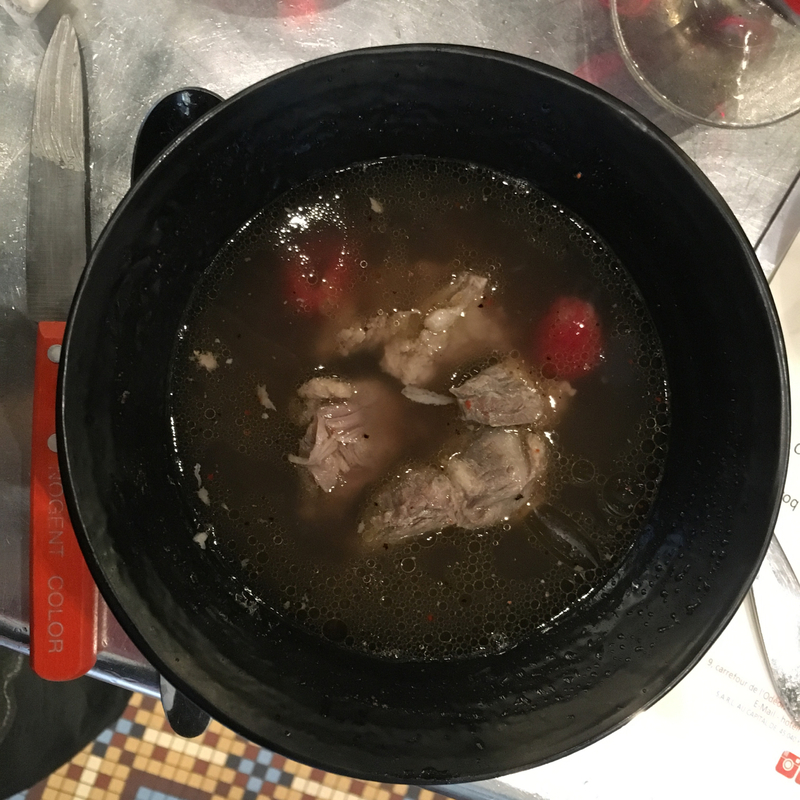 Equally bizarre, but less offensive, was a pork soup, in the murky depths of which floated raspberries whitening in the heat. 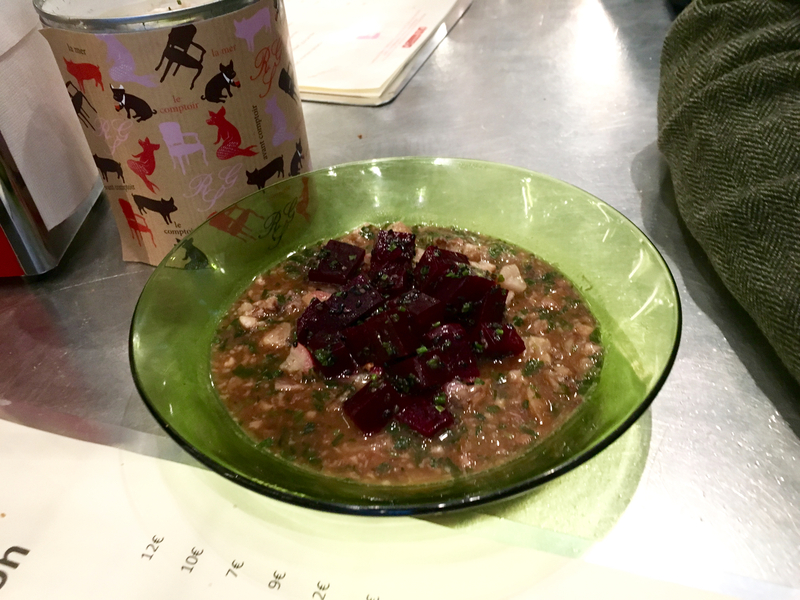 I won't forget it, but nor do I envision ever consuming such a dish again, short of getting stranded on a deserted island with a sow and a raspberry bush. I love pork as much as the next guy. But I like it in familiar forms: sausages, charcuterie, ears, feet, ribs, etc. Until we abandon the earth as uninhabitable, probably during the second or third Trump administration, I'd prefer not to eat like an astronaut. 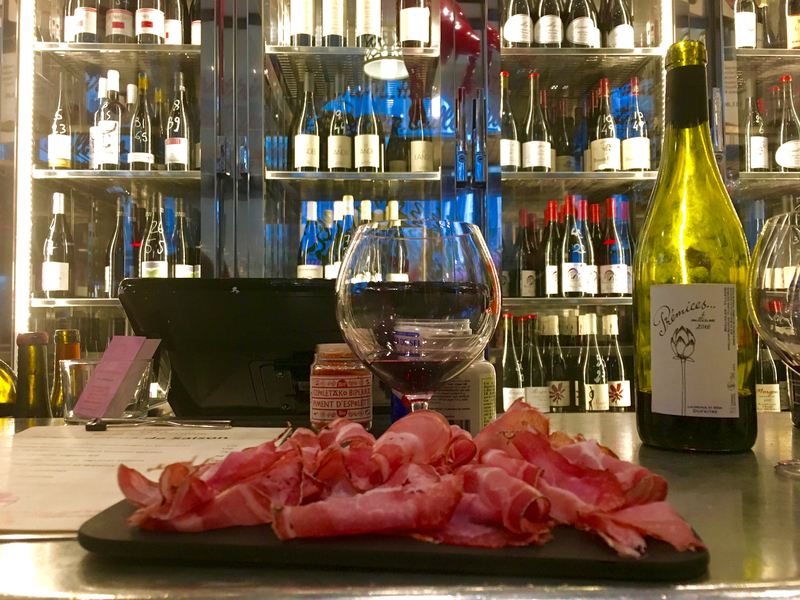 Happily L'Avant Comptoir du Marché is stocked with an impressive range of more familiar cured meats. The bar is most successful where it hews closest to the Basque bars that inspired it. Quick no-nonsense service of wine and good ham, standing-room only. 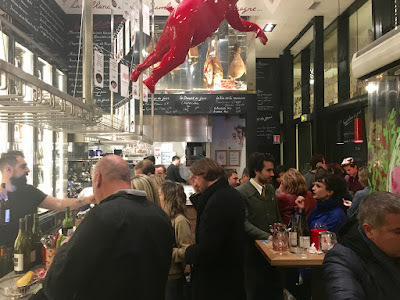 Service at L'Avant Comptoir du Marché is typically very good - for the restaurant opening, Camdeborde astutely hired former Jeu de Quilles proprietor Benoit Reix, a noted chef himself with long experience in the natural wine scene. 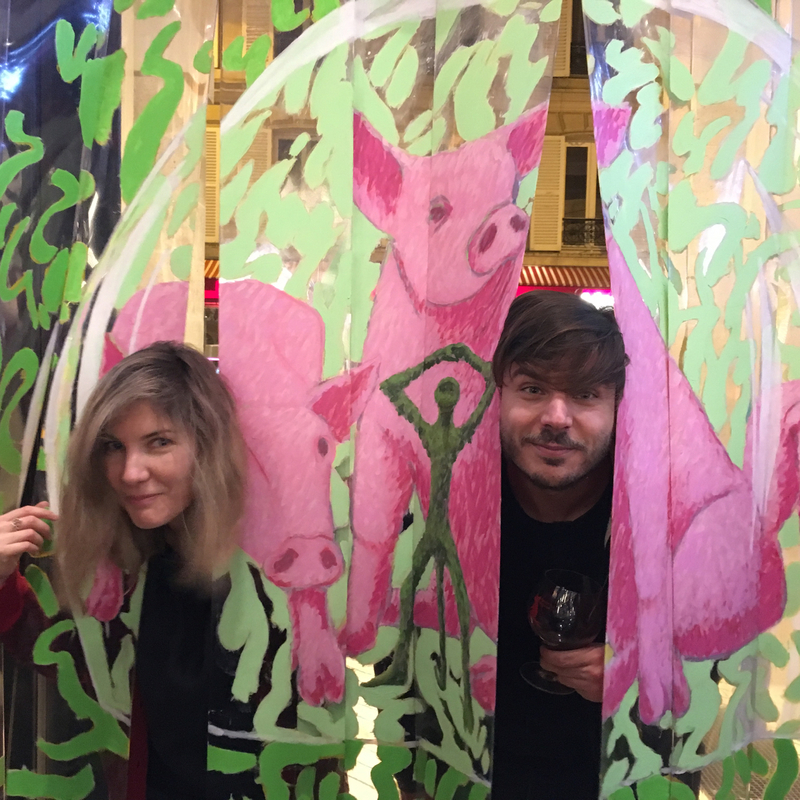 My friends and I washed away the memories of the pool of pigs' feet with a bottle of Rémi Dufaitre's 2016 handsome Beaujolais-Villages "Prémices." Dufaitre and his neighbor and mentor Jean-Claude Lapalu were the golden boys of the 2016 vintage; while their natural vigneron peers in crus to the north suffered greatly from hail that year, the winemakers of Saint-Etienne-La-Varenne and Saint-Etienne-des-Ouillières were largely untouched, allowing them to make the most of an archetypal vintage. 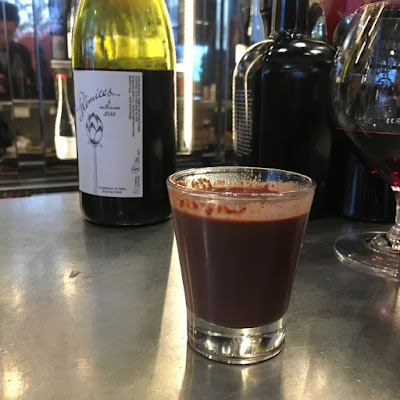 I first noted the promise of the 2016 "Prémices" when tasting it from tank back in November; at L'Avant Comptoir du Marché this spring I was elated to re-encounter its buoyant dark-cherry fruit unfaded in bottle. 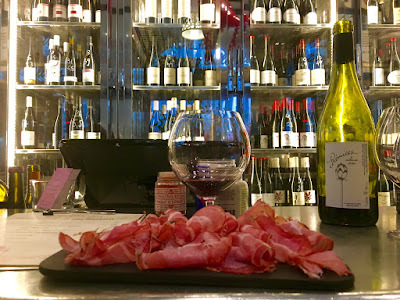 L'Avant Comptoir du Marché's wine selection is lightly weighted towards the Beaujolais; it is further distinguished by the routine appearance of back vintages, particularly in the bar's magnum selection. After my last visit I made a resolute promise-to-self only to order magnums when I return. I will indeed return, despite weirdo dishes, despite the routine tourist crush, despite the unhygienic free-for-all of pickles, butter, and creepy "rillettes" that are merely whipped fat. 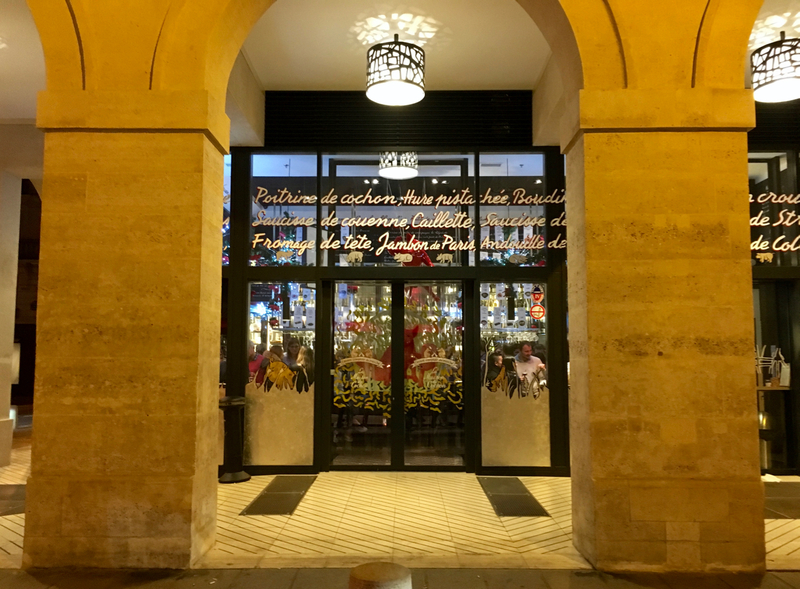 Mostly because, almost a decade after the opening of the original L'Avant Comptoir, there is still almost nothing like its concept in Paris. I'm tempted to say that entering L'Avant Comptoir du Marché is like entering an alternate universe where questionable taste has been rewarded with popular success and limitless critical esteem. But that universe is our own. It is our agricultural system, our economic system, our political system. Camdeborde's genius has been to subvert this and embrace it at the same time. My 2011 post about the original L'Avant Comptoir. Le Fooding on L'Avant Comptoir du Marché. Time Out's piece on L'Avant Comptoir du Marché contains some witty dialogue from Yves Camdeborde. Even an alien life-form would get the gist of L'Avant Comptoir du Marché after reading Wendy Lyn's exhaustively service-oriented rundown at Paris Is My Kitchen. Gilles Pudlowski on L'Avant Comptoir du Marché. 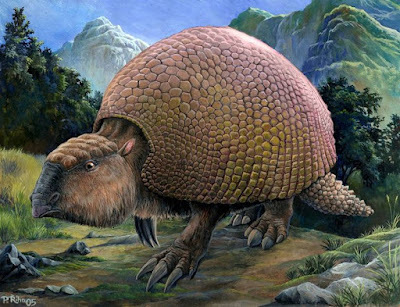 Here, as in pretty much all of the above reviews, the author has dutifully trotted out various promotional catchphrases ("The pig is king!" etc.) that almost surely originated with the restaurant group itself.